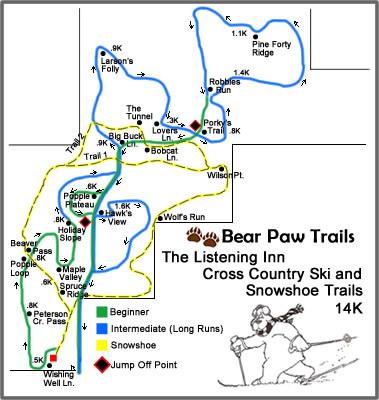 Bear Paw Trails are located on the private property of The Listening Inn. They include 14.5K of classically groomed cross country ski trails and 6 miles of snowshoe trail. The trail winds its way through various terrain, including hardwoods, pines, Peterson Creek views, and open meadows. It is suited for beginner and intermdiate skiers. Bear Paw Trails are open to the public daily from 9AM to 4PM. There is a fee to use the trails (guests of The Listening Inn may ski/snowshoe for free!) and a season pass is available. Cross country ski and traditional snowshoe rentals are also available, as well as lessons by appointment. The folks at The Listening Inn welcome you to join them inside the Inn for hot beverages and snacks while using the trails. For trail conditions and rental availability call (906) 822-7738 or click here.